Kate Fowler Tutt (1868-1954) has been inaccurately and unfairly mythologised as having objected to the display The Kiss in the Town Hall in 1914. No convincing evidence has been found that she actually did object to Rodin’s sculpture being put on view. This urban myth has caused her reputation to suffer, and her achievements in improving the lives of working families and their children to be ignored. As head of South Malling Elementary School and then of Central Senior Girls’ School, she was particularly concerned with her pupils’ well-being; later, as chair of the borough council housing committee, she oversaw the first stage of the building of the Nevill Estate. During World War I she preached and practised thrift and recycling; in World War II her efforts were directed towards making the education committee provide adequately for evacuee as well as local children. Convinced that women’s involvement was essential to good government, she addressed women’s groups all over Sussex, exhorting their members to play their full part in the community. Further study of the tooth enamel of the 10th-century skeletons of the group of men executed and buried in a pit on Malling Down has confirmed that the men were not local, but thrown doubt on the theory that they were Viking raiders. Greg Chuter, the Assistant County Archaeologist, has been informed that high level of lead have now been identified, suggesting that they came from an urban environment in which lead piping was used for water supplies. On 9 September 1775 Thomas Davy of the Cliffe, surgeon, granted a 40-year lease of a plot of land on Chapel Hill to 15 trustees, at a rent of £1 p.a. The plot’s southern boundary was the King’s highway leading up Cliffe Hill, and its eastern boundary Thomas Baldy’s garden. Its western and northern boundaries were Thomas Davy’s own house and stables, and the plot already contained a recently-erected building in use “for the worship of Almighty God in the manner of dissenters from the national established church and for preaching the Gospel agreeable to the Acts of Toleration upon those principles and tenets which are commonly called Calvinistic”. Fewer than half of the new trustees were from Lewes or Cliffe, with the remainder fairly evenly divided between the surrounding villages and the more metropolitan London and Brighton. In 1801 All Saints and Cliffe were the most populous parishes. Early 19th century growth was fastest in St John-sub-Castro, with quite large increases also seen in Southover and All Saints. In the second half of the 19th century growth was fastest in St Anne’s, as Lewes expanded westwards. Population growth in Lewes followed the national trend in the first half of the 19th century, almost doubling in 50 years. In the second half of the century the national population almost doubled again, but in Lewes slowed to a crawl (just a 14% increase). This effect seems specific for Lewes. Seaford increased by 262%, Uckfield by 189% and Hailsham by 230%, over the same period, though all from much smaller bases. The trend continued in the 20th century. Lewes increased by 55% between 1901 and 2011, compared to 9-fold in Seaford, 5-fold in Uckfield and Hailsham almost 5-fold. The national population doubled. Seaford and Hailsham are now both comfortably bigger towns than Lewes, and Uckfield is hot on our heels. The railway arrived in Lewes in 1846, but instead of bringing prosperity, it seems to have provided an escape route! John Latter Parsons (c.1806-1885) was a stonemason and slate merchant based at Eastgate Wharf. The business was developed by his father Latter Parsons (1773-1848) and uncle Charles Parsons (1776-1828), and then run by John Latter Parsons in partnership with his cousin Charles Parsons (c.1814-1881). When John Latter Parsons retired in the 1870s, his share passed to three of his sons. The stonemason business was sold to C.F. Bridgeman in the 1880s, but Parsons Brothers continued as a timber merchants until well within living memory, based at the now-derelict Wenban Smith site on the northern part of Eastgate Wharf (today behind Waitrose). John Latter Parsons and his wife Catharina Mercy (1814-1853) had eight children born between 1838 and 1851, before Catharina Mercy died in her late 30s. The eldest boy, named John Latter Parsons after his father, died as an infant, but four sons and three daughters survived to adulthood. All seven married, and five of them married into the same family, the Manningtons. The Manningtons were yeomen farmers who spread from an 18th century base at Horeham in Waldron parish to large tenanted farms across East Sussex including Isfield Place, Laughton Place, Court Lodge Farm in Ewhurst and the Abbey Farm, Robertsbridge. John Latter Parsons’ eldest daughter Catherine Parsons (1838-1926) married in 1867 to William Mannington of Isfield, yeoman (1835-1899), the only son of Peter Mannington of Isfield Place. Her brother Thomas Parsons (c.1844->1927) married in 1873 Mary Ann Mannington (1848-1899), a daughter of Isaac Mannington of Ewhurst, yeoman. After her death he married again to her younger sister Martha Mannington (1858-1923), who was the twin sister of his youngest brother’s wife. Marrying your deceased wife’s sister was always frowned on by the Anglican church, and was illegal in England between the 1835 Marriage Act and the 1907 Deceased Wife’s Sister’s Marriage Act, but if you married abroad, the marriage was then recognised in England. Their sister Sarah Elizabeth Parsons (1846-1911) married in 1873 William Mannington (c.1850-1925) of the Abbey Farm, Robertsbridge, who also a son of Isaac Mannington of Ewhurst. Their sister Joanna Parsons (c.1848-1919) married in 1883 to Charles Mannington (born 1855), another son of Isaac Mannington of Ewhurst. Their youngest brother Henry Joseph Parsons (born 1851) did not join the family business like his brothers. He was instead apprenticed as an ironmonger and traded in this capacity in Lewes. 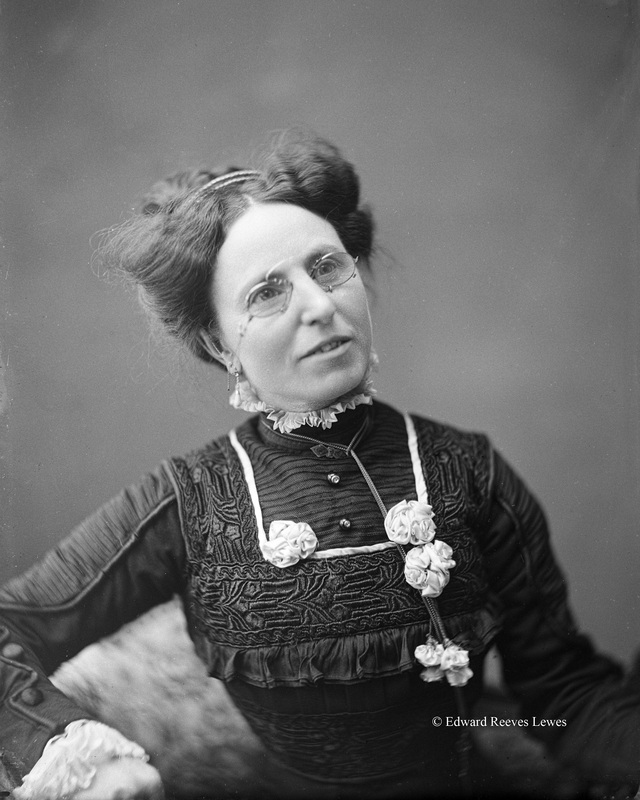 However, he did conform to the family habit of marrying Manningtons – in 1879 he married Grace Mannington (born 1858), one of Isaac Mannington’s youngest daughters, whose twin sister was later to become his brother Thomas Parsons’ second wife. William Mannington of Isfield and Isaac Mannington of Ewhurst were cousins. However, this was by no means the full extent of the links between the families. John Latter Parsons’ wife Catharina Mercy was a daughter of Malling Street timber merchant and builder Thomas Berry. Two of Thomas Berry’s other daughters married Manningtons, and one of them thus became the mother of Isaac Mannington of Ewhurst. Thomas Berry’s family was spread over more than 20 years, so his Parsons grandchildren were marrying his Mannington great-grandchildren. John Latter Parsons’ cousin and business partner Charles Parsons had married Isaac Mannington’s sister in 1851, and when John Latter Parsons retired to Prince Edwards Road and married again after nearly 20 years as a widower his new wife was another of Isaac Mannington’s sisters (and his first wife’s niece). Isaac Mannington’s wife Mary Ann was Charles Parsons’ sister. After her death his second wife was his cousin Mary Waite Mannington, William Mannington of Isfield’s sister. Is that all clear? As early as 1841 John Latter Parsons’ eldest daughter Catherine, aged 3, was missing from home in the census (John Latter Parsons junior had only recently died and there was a new baby, Latter Parsons). She can be found miles away in Waldron, parked with her aunt Martha Mannington’s family. The link between the Berry, Mannington and Parsons families is the chapels they attended. The Manningtons attended, depending on their tenancies, either Heathfield Independent Chapel at Cade Street or the Countess of Huntingdon’s chapel in the Cliffe. After the 1816 defection that led to the creation of Tabernacle, those based near Lewes transferred their allegiance. The Berrys and the Parsons also worshipped at Tabernacle. John Latter Parsons, his son Thomas Parsons, Charles Parsons, Peter Mannington of Isfield and his son William Mannington were all Tabernacle trustees. 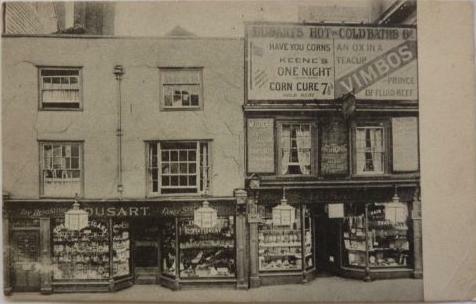 This Mezzotint Company postcard shows Dusart’s shop on Lewes High Street before it was destroyed by a fire in October 1904. The Lewes fire brigade could not prevent the building being completely destroyed, and Mezzotint also rushed out a photographer to record the aftermath. The consequent postcards are quite commonly encountered – one is featured in Bulletin no.48. 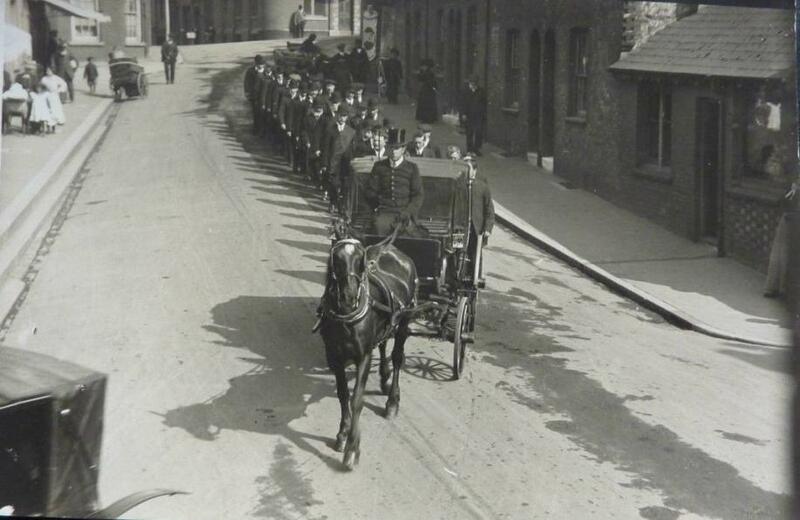 This excellent picture of a horse-drawn funeral procession heading from Commercial Square down to St John-sub-Castro church was sold on ebay last Spring. 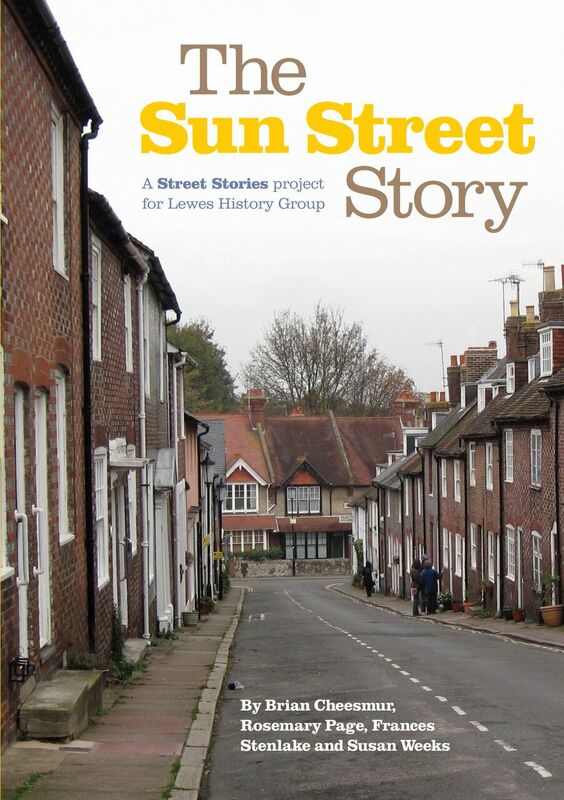 Sales of the Lewes History Group’s first print publication, ‘The Sun Street Story’, have exceeded expectations. The first print run of 200 sold out before Christmas, and a second 2017 print run are now also selling very well. Financially the publication has already covered its costs, though that was not our primary aim. The dramatic presentation at our November 2016 meeting, ‘The Darker Shades of Sun Street’, based on one section of the book, was recorded and is available via the Rocket FM website. The December 2016 Love Lewes Podcast features co-author Rosemary Page talking about the book and the activities of the Lewes History Group, while Rosemary Page and Brian Cheesmur were interviewed about Sun Street on location by Karen Dobres for Chalk TV on 10 January 2017. These items can all be accessed via the Lewes History Group website. Thanks to a Heritage Lottery Foundation grant, three of Lewes Town Council’s best known paintings are to be restored by an expert team at the Hamilton Kerr Institute, Fitzwilliam Museum, Cambridge. They are Archer’s painting of the 1830 visit of King William IV to The Friars [see Bulletin no.60], a 17th century painting of the Protestant Reformers, and Thomas Henwood’s 19th century interpretation of the Battle of Lewes. The restoration is expected to be completed by August 2017. This entry was posted in Art & Architectural History, Ecclesiastical History, Education History, Family History, Lewes, Local History, Population History, Social History. Bookmark the permalink.